Yep it’s time for SWAK’s annual Knit Out Weekend and people – I’m a goin’. The laundry’s washed and folded. The backpack is airing out. The knitting bag is loaded with yarns a plenty, extra needles, various accoutrements. I’m taking three workshops, two from Wendy Johnson on socks and one from Joan Schrouder on mittens. Dang it’s going to be fun! Friday night is usually a big party with games and gambits rounding out with good food. Saturday will hold two workshops and close with another evening of knitterly fun. Last year the Fashion Show was of Vogue’s new line each item modeled on a SWAK employee or customer. It was wonderful to see how the patterns looked on real people. This year there will be a trunk show from Tempted Yarns and some sort of surprise from Lorna’s Laces! Cathy and I will meet up in Guthrie and have a grand time all weekend. Oh yes – there will be wine. There will be munchies. There will be late night laughing. Today I spent some time working on the lavender side of things. This morning we had a visit from our Oklahoma Ag guy for our annual Organic Certification. Chris always laughs and makes fun of my notetaking in the field journal but today it paid off because I could answer all those detailed questions about when we fertilized, when we harvested and how much, when we treated the field with lime dust, when the bunny’s eyes opened. Well Jeff didn’t really care about when the bunny’s eyes opened but I had it documented. (A rabbit had babies in one of our veggie raised beds and for some unknown reason I write down things like that. )This afternoon I hauled rocks, I stepped up plants from 4″ pots to gallons and I gave the evil eye to cows. Apparently either our neighbors the monks are running cattle now or another neighbor’s cattle got lose due to a fence break from the storms. Regardless the loud cows were at the very corner of the monastery land that crossed at the top of our lavender fields. We have three dogs. They are of absolutely no help. Here’s Stormy on the porch. I woke her up taking the photo. 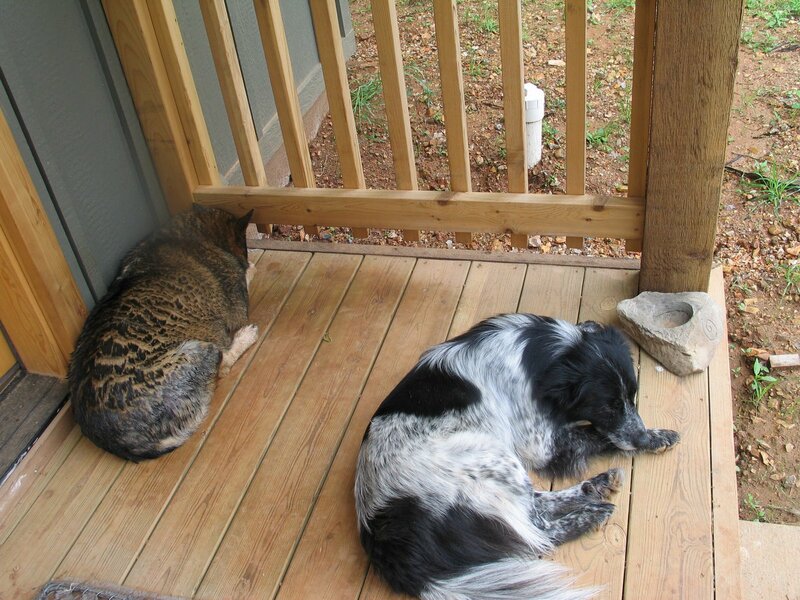 Katie and Martha prefer the front porch. I would show you the renegade cows but they’re limited to splashes of brown in the trees and the occasional white cattle egret taking flight. Hauling rocks the day before a big knitting retreat is not wise. Ouch!